The Peachy Keen design team along with PKS alumni and several stamping friends want to celebrate the birthday of the Peachy Keen princess, Angelica Suarez. For those of you that don't know Angelica, she is the daughter of the Peachy Queen, Kathy (owner of PKS). She organizes and directs the design team in challenges, blog posts, new stamp release parties and other PKS events. Besides all of this work, she has her own stamp company called Market Street Stamps and directs her own design team over there as well. She's an all-around fantastic lady to know! Your last stop is the wonderful Emma Aguilar. Check out all the other wonderful birthday cards from the other ladies in the hop if you missed any stops along the way. Several of the girls are giving away blog candy, so you'll want to hit all the stops and leave comments! Love your chick!! He is adorable!!!! This is such a sweet card love that little chick!!!! So cute!! Happy Birthday to Angelica! This card is so totally cute, Kim! I LOVE it, and I especially love the colors and papers. Beautiful work as always!! So cute, just adorable! That chick is so cute! Very cute and sweet card design! Kim you make the CUTEST things with that duck die! LOVE this card! Kim this card just quacks me up! Lol sorryi know it's corny but I couldn't help myself. Your card is beautifully put together. I think I am gonnajust spend a week at your house and soak up as much as I can. That little duck is oh so cute! I LOVE it! How stinkin cute is that! I love that chick cut. Kim, I love your card, super cute little ducky! I love how he's wearing his eggshell pants!! ha ha! So sweet!! This is just Precious! The ducky is adorable and the colors are beautiful!! I love this one!!! Wow, your card is so super cute!! I just love your little duck and your color scheme is gorgeous..
that chick is soooo cute ... great card! So cute this is one of my favorites.Love this set. I love your little duck. aww...such a cute, cute little duck! What a cute little duck. Happy Birthday Angelica! The Birthday Chick Card Is Too Cute!! Great Birthday Blog Hop!! Absolutely adorable!! I love the colors. Very cute especially the eggshell. 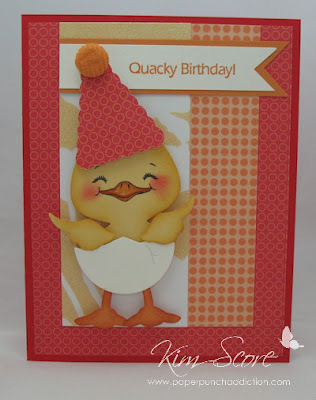 I love this sweet little card with the adorable ducky! this is for Stephanie blogger wouldn't let me comment on your blog. I loved your card also!!! How sweet is this chick?! Super cute. Awh, what an adorable card. Cutie duck. Totally CUTE and ADORABLE!!! Love this little ducky! That is so cute!! I love this little duckie and the patterned papers are amazing!! I have seen more of the PKS than ever before and I'm loving them more than ever. I love your card it is so cute. Thanks for all the information on the dies and stamps.